Contents and Media: 123 light grey plastic parts on 2 sprues, 7 clear plastic parts on 1 sprue, decals for 2 aircraft plus a 4 page fold-out instruction sheet with history, 19 build diagrams and 2 pages of paint/decal instructions. 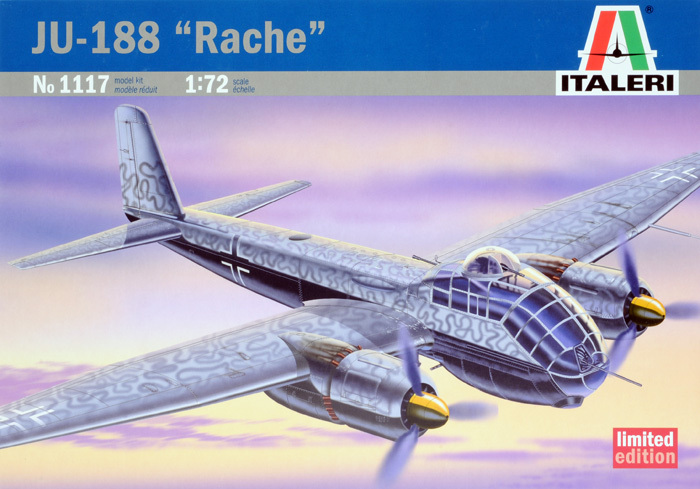 Advantages: Interesting subject; good decals and clear parts; the only 188 available in this scale; optional variants; one of Italeri's oldies but goodies. Disadvantages: Raised panel detai; could use more interior detail. Recommendation: Recommended because there is nothing newer on the market. Because of the Ju 88’s success, the 188 was delayed to the point where there were never enough to make a difference. Even so, with its more powerful engines, more aerodynamic fuselage, longer wings and bigger tail surfaces it was a much more capable aircraft than the Ju 88, designed to have either the BMW 801 radials (Ju 188 E-1) or Jumo in-line 213 engines (Ju 188 A-1) and carry bombs, torpedoes or cameras for recon work. As most of you would be aware, this is not a new moulding but a Limited Edition reissue by Italeri. It is one of Italeri’s better earlier kits with some interior detail and raised panel detail on the outside. 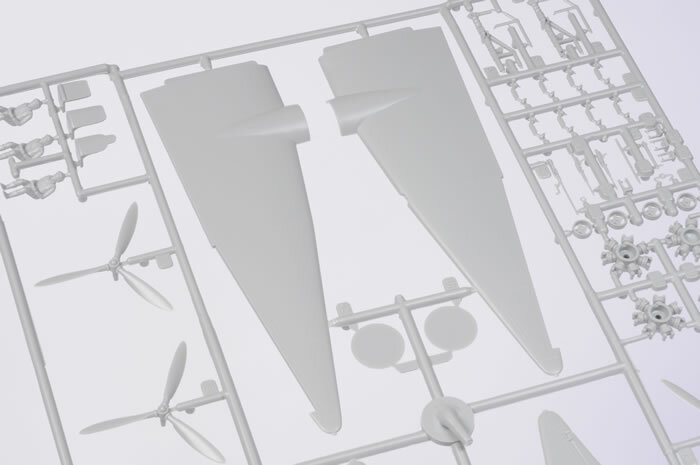 The kit comes with two main sprues in light grey plastic with the “A” sprue having fuselage halves, engine nacelles and cowlings of both types, main wheels, tail planes with positionable elevators and rudder plus a few smaller details. “B” has the four piece main wings, two types of props, BMW engines, spinners and backing plates, main under carriage legs and doors, armaments, bomb racks and bombs. 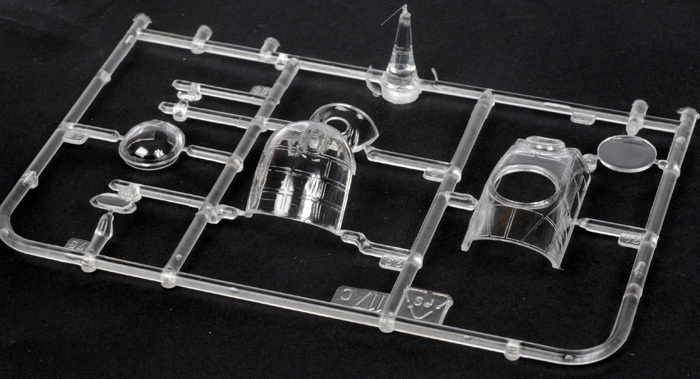 “C” is the clear sprue with seven parts and in typical Italeri style they are very clear with nicely engraved panel detail. There are markings for two aircraft and I'm told they are the same as the original issue with one, a Ju 188 A-1, A3+BP ( unit not given) in dark green (RLM 71 or 70) over light grey (RLM 65 or 76) with black spinners and white spiral. 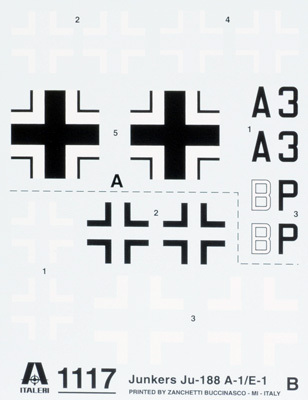 The other is a Ju 188 E-1 with no codes and also the unit is not given with the over water light grey with dark grey squiggle and black under surfaces. This aircraft has black spinners with one segment in yellow. The first, with the Jumo engines has bomb racks while the other has BMW radials and no racks. A full set of bombs are supplied for the racks but the bay is moulded closed and there is no interior. The decals by Zanchetti Buccinasco are well printed but a little uninspiring. I am sure there will be after-market decals around for those who want more. Italeri has been the leader in 1/72nd scale twin engined bombers, both Allied and Axis, for quite some time but they are now being overtaken by others, mainly Hasagawa, and I wish Italeri would go back and modernize some or all of theirs before it's too late. In the meantime, this is the best Ju 188 in the scale (Matchbox releases a Ju 188 earlier than Italeri, which was more basic) and it's a Limited Edition so best get in quick if you want one of these still reasonably good models.